My model hunt brought me in contact with quite a few amateur & professional models, but none of them seemed to be the type I was looking for! I DID NOT want a size zero anorexic model to be the face of my brand. I wanted a tall woman with curves......you know the type I mean? My clothes were for everybody and I wanted the girl modelling them to be like the average woman, instead of boasting of vital stats that everyone envies but very few have! And then fellow blogger Uparna of Fascinated or Fixated suggested that I could try out her sister who matched my requirements and who was currently home from her duties on her ship as a marine engineer. I met them, spoke to them and voila! It was all fixed up in a couple of days!! I had found the girl I wanted to put my clothes on! One hectic day of ironing, packing, travelling to friend's studio, setting up the equipment, doing hair & make-up, styling, changing clothes one after the other, sweating it out in the harsh lights of the reflectors & flash, having a late & hurried Subway lunch; torturing Urmita (that's my model) with "a little more angle", "head up", "chin a bit more down" blah blah (you get the drift); last minute running around & okaying one shot after about taking 20-30 of them - and here I am, sharing the outcome of it all with you! For my international (non-Indian) readers, this is a traditional Indian costume called the Saree. It's basically a piece of fabric that is five & a half meters long and that is draped by a woman on herself, making it into a garment. There are various ways of draping a saree and it is worn with a short bodice (called the Blouse) which covers the upper part of the torso. 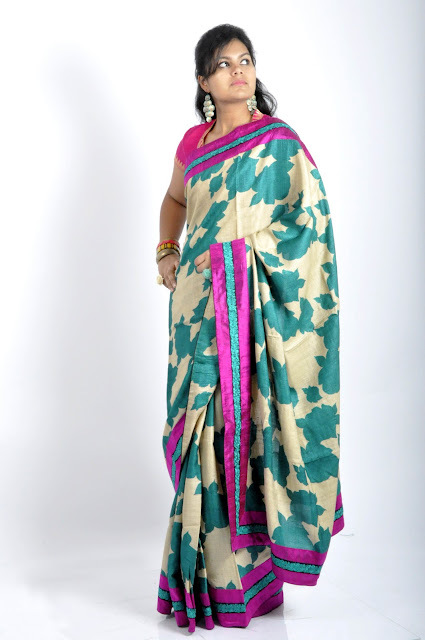 My collection of sarees comprises of different types of materials like cotton, silk, silk blends & jute-cotton blends. The length of fabric is embellished with borders that can be made of other fabrics as well as embroidery & other trims. Once again, my collection is a riot of colors with some floral prints & embroidery motifs thrown in for good measure. I even have a retro-inspired polka-dotted one that is as fun as it is chic!!! Your kurtas are really cute and vibrant, but your saree collection is amazing!!! I loved every single one of them!! Your model is also really nice, though I'd like a slightly different background :-). All in all, a beautiful collection!!! fab collection babe.. the kurtas are really beautiful..would be great if you would mention the prices in the pictures in the facebook page .. Your dresses are very pretty! As i have told you before...a lovely collection...all the best to you!! my fav among these is kurti #1, saree #4,6 and 7. The saris are a beauty Anupriya! Hey!! First of all my apologies for reverting to your comments so late..
And dropping by today couldn't have been more pleasant. Of late I am having this urge to go fine dining wearing a saree (???? its my stylist mind on a constant go)..and your collection totally fits something I would wanna slip into.. Caught up on your previous posts too..loved the floral outfits and drooled over the tasseled necklace..its so pretty and interesting!! I appreciate that you went for a model with curves. But some of us are blessed with a tall, skinny, size zero figure. Being size zero doesn't mean being anorexic. Wouldn't it be insulting if I had a brand and said "I don't want a fat girl with huge thighs and a tummy to be the face of my brand". I really liked the kurta with pink touch is great. I like the fact that you used silk for your pieces. It's a brilliant collection, very vibrant colors and the prints are amazing. Congratulations! Your hard work really paid off. I love some of the saris though i used to wear kurtas in college but not now. Must say that is one beautiful collection.. M a big fan of sarees which often itches the feminine indian side of me and your collection has some incredible pieces!! I live in US so dont wear sarees that often but they are my go to outfit for every indian occassion whether be a birthday or wedding!!! I love the wat you've kept it simple yet stylish, taking the needs of everyday women in mind!! Can I buy them Online ?? So glad that you found the perfect model for your brand. Oh, I miss the days of organising for a shoot. I love these saree colour combinations, my favourites are 1, 3, and 5. Good work! Oh, I love your designs. The green dress with the blue border is my favorite. @Urmila: Of course, dear! Why don't you shoot me a mail at howrahbridgebyadg@gmail.com? I love the sarees, ahhhhhhhhhhhhhh they are really magical. Wow, these are some really beautiful pieces! 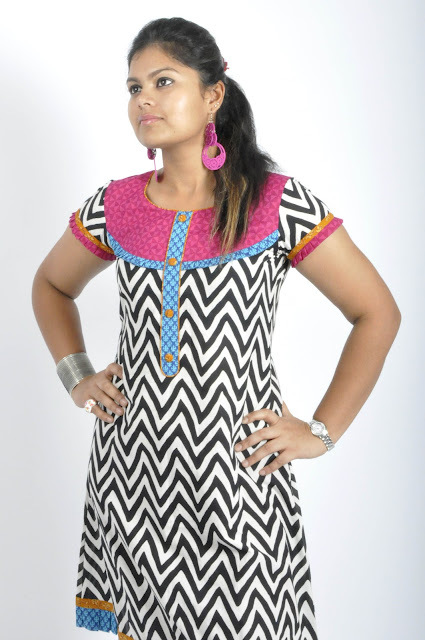 I love the black and white chevron print kurtas sooooooo much!! Great job! And your model is so gorgeous! All the best! Hope you are having a wonderful day! What a magical mix of prints and fabrics. I like the fact that the kurtas are so versatile in how they can be worn, meaning endless styling possibilities. And the sarees are simply sumptuous. It's a wonderful adventure you are undertaking and I wish you continuing (and growing) success. Now I know where to shop from when I;m back home :) lovely blog dear! Sarees are absolutely gorgeous & classy and your model looks lovely! I think the kurtas are also equally pretty but the fit is not perfect, which is making a lot of difference. Good luck! The yellow sari with green border is amazing..
Congrats on reaching 200 followers..Keep up the good work..God Bless!! the tunics are brilliant! specially the chevron prints :) can u pl put up the costs? Lovely collection there!!! Gorgeous and vibrant use of colours in kurti's and sarees.. The kurtis and sarees look all the way to elegance! Especially these look perfect for the summers and spring season..Thanks a lot for sharing! Kurtis design is fabulous,i like all collection, you can purchase latest designer kurtis collection from G3 fashions surat.